Telluride is located in southwest Colorado in the San Juan Mountains. Situated between Montrose and Durango along the San Juan Skyway, the beautifully scenic drive is all part of the Telluride experience. Driving south from Montrose you will pass by fashion icon, Ralph Lauren’s 16,000-acre ranch set against the dramatic backdrop of 14,000+ ft mountain peaks. Venturing north from Durango you will pass over the “million dollar highway”, a climatic adventure through high mountain passes, canyons, and historic mining remains. 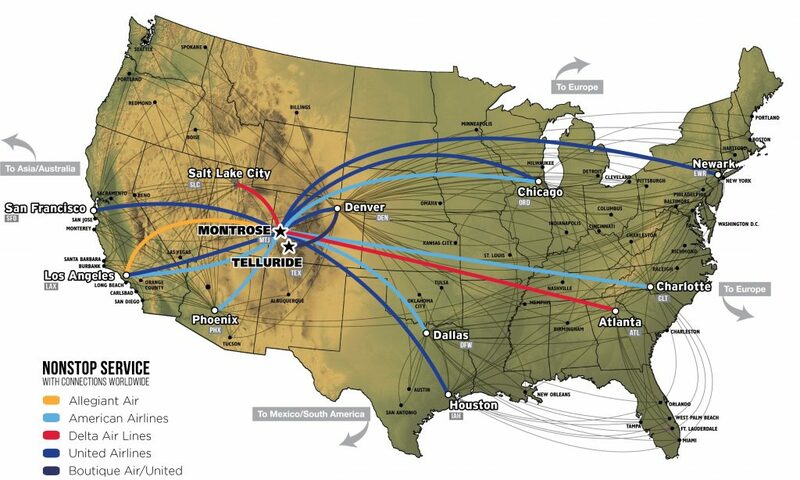 Telluride Airport (TEX) – The Telluride Airport is the highest commercial airport in North America. Multiple daily flights are offered from Denver (DIA) via Boutique Air and the United Airlines network. The airport is also open to general aviation and private aircraft. Montrose Airport (MTJ) – A little over an hours drive from Telluride, Montrose Airport offers many direct flight options on major airlines from cities around the United States, including Houston, Dallas, Phoenix, Chicago, Los Angeles, New York, San Francisco, Atlanta and more. There are numerous ground transportation options to get you from Montrose to Telluride.